Elerson Trace West is self-managed and is contacted at its e-mail address elerson.trace@yahoo.com or by writing to P.O. Box 631, DeSoto, TX 75123. Homeowners, please submit your e-mail addresses annually. If your e-mail changes at any time, please immediately submit your new e-mail to the HOA. 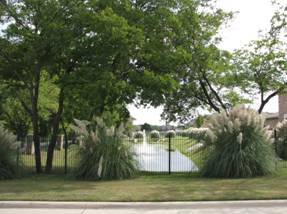 The Elerson Trace West neighborhood is located south of Beltline Road (FM 1382) and west of Elerson Road. This subdivision consists of 53 beautiful one and two story homes. A diverse neighborhood Elerson Trace West has been served since 2006 by a mandatory Home Owners Association. This HOA is under the direction of a 5-member board of directors who also serve as block captains. The esthetics and property values of the neighborhood are further mandated and protected by association, by-laws, and property deed restrictions. Elerson Trace West is a beautiful and highly desirable neighborhood in which to live. Our Homeowners' Association members support and participate in our efforts to maintain and improve its status and position in the community. The committee brings the HOA members together to get to know each other at little or no HOA cost. and help with school projects.